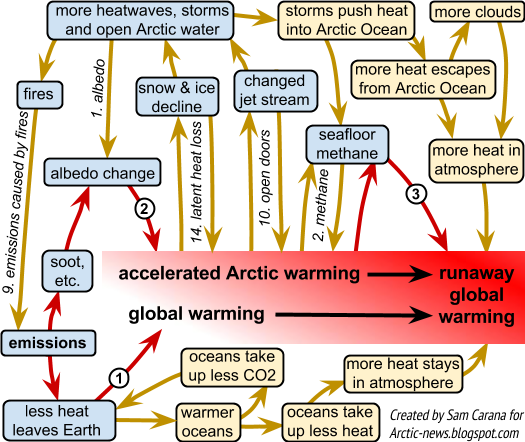 Arctic News: How much warming did and could people cause? How much warming did and could people cause? In the above image, temperatures have been adjusted to better reflect a preindustrial baseline (1750). The image shows that the temperature in 2016 had crossed the 1.5°C (2.7°F) guardrail set by the Paris Agreement and was higher than it had been before during the Holocene. People had already caused warming before 1750. The image below gives an idea of total anthropogenic global warming, including the warming people caused before 1750 and including the warming that is already baked in for the decades to come, with the vertical axis cut off at 2°C. James Hansen et al., in a 2017 analysis, conclude that maximum Eemian temperature was +1°C relative to preindustrial. Accordingly, to find temperatures as high as today's, one would have to go back some 3 million years, to times when temperatures were still coming down from the PETM mass extinction. 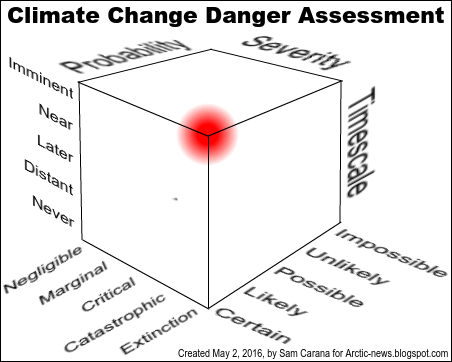 How do we know that we're well above 1.5°C anthropogenic global warming? How much warming did people already cause and how much further warming could people cause in the near future? NASA's default baseline is 1950-1981. 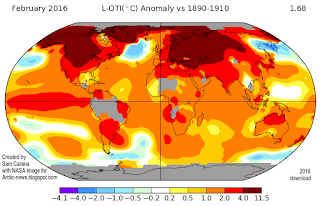 Changing the baseline to 1900 ±10 years (or 1890-1910) makes a difference of some 0.3°C or 0.54°F, as illustrated by the NASA image on the right. 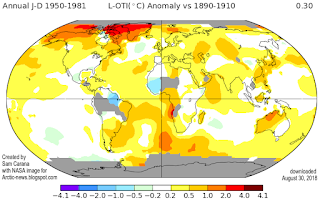 The graph below was created with the NASA L-OTI monthly mean global surface temperature anomalies from 1951-1980, and then adjusted by 0.29°C to cater for the rise from 1900 to 1951-1980, which makes the anomaly 0°C in the year 1900 for the added polynomial trend. 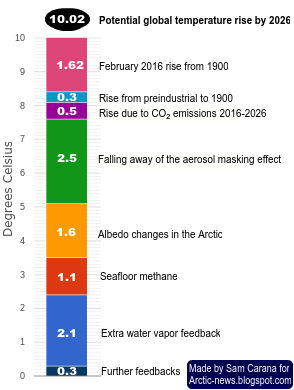 Thus, merely changing the baseline to 1900 will bring the 2016 temperature rise to above the 1.5°C (2.7°F) guardrail set by the Paris Agreement, i.e. 1.27°C + 0.29°C = 1.56°C. For specific months in 2016, temperatures did rise even more. It was as much as 1.68°C (or 3°F) warmer than 1900 ±10 years (or 1890-1910), as illustrated by the February 2016 image on the right. Changing the baseline to preindustrial (1750) will bring the 2016 temperature rise even closer to 2°C. Were these high temperatures in 2016 due to El Niño, or were they a sign of things to come? The graph at the top shows that a combination of warming elements could bring the temperature rise from preindustrial to the year 2026 up to 9.68°C or 17.42°F (annual) or 10.02°C or 18.04°F (monthly peak). How much could temperatures rise by 2026? The above image shows how a rise of 10°C (18°F) could occur by the year 2026, based on temperature anomalies from 1750 for February and on progressive growth of warming elements. 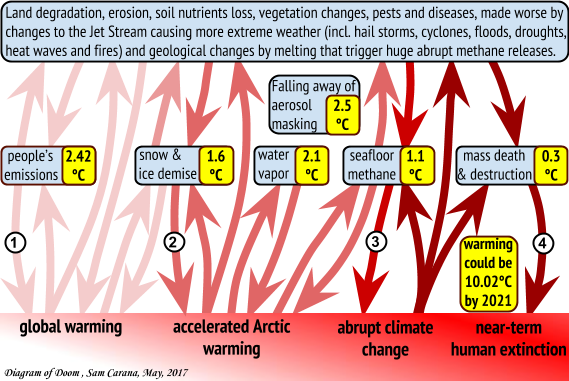 Above image shows elements that contribute to warming, with the accumulated impact shown as the dotted line (total rise). The image below shows the elements contributing to such a rise in another way (stacked bar chart). Such a rise could take place even more rapidly than displayed, as discussed in the earlier post 10°C or 18°F warmer by 2021? For more on calculating the temperature rise from 1750 to 2016, see this page and this post. 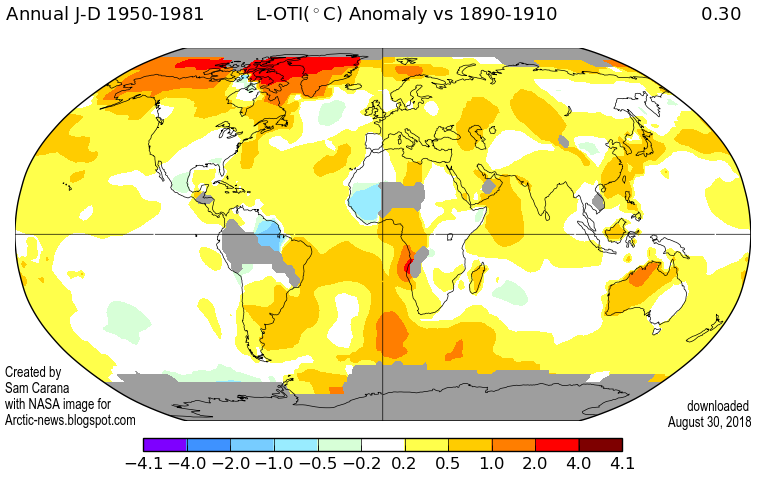 When also taking this warming into account, it was 1.92°C (3.46°F) warmer in February 2016 than in pre-industrial times. 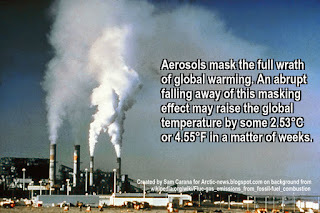 With dramatic cuts in emissions, there will also be a dramatic fall in aerosols that currently mask the full warming of greenhouse gases. From 1850 to 2010, anthropogenic aerosols brought about a decrease of ∼2.53 K, says a recent paper. While on the one hand not all of the aerosols masking effect may be removed over the next few years, there now are a lot more aerosols than in 2010. Additionally, some aerosols have a warming effect and there may well be an increase in emission of these aerosols over the next decade. A 2.5°C warming due to removal of part of the aerosols masking effect therefore seems well possible by the year 2026, especially when considering further aerosol impact such as caused by burning of biomass, as discussed in this post. 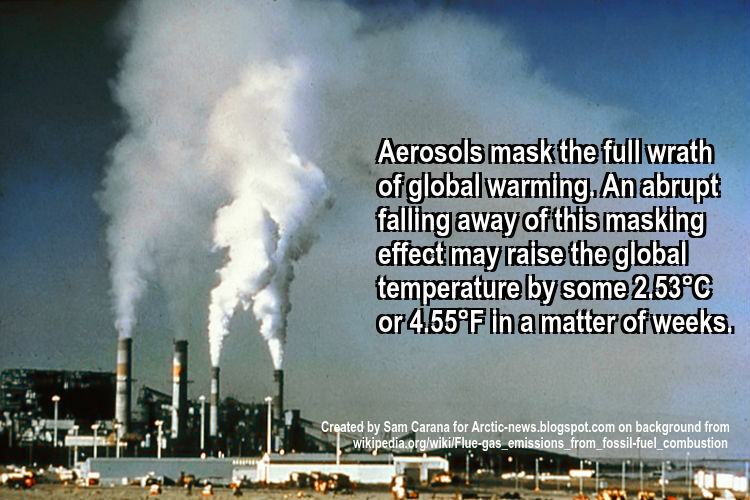 For more, see the aerosols page. 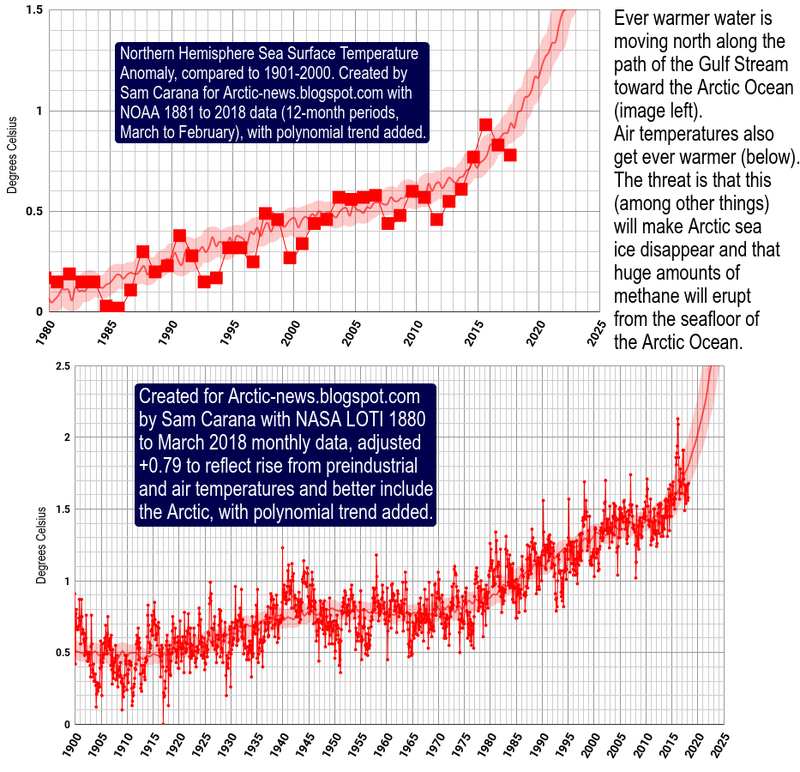 Warming due to Arctic snow and ice decline (i.e. of both sea ice and the snow and ice cover on land) may well exceed 2.6 W/m², calculated Professor Peter Wadhams in 2012. This could more than double the current net global warming caused by people since pre-industrial times. 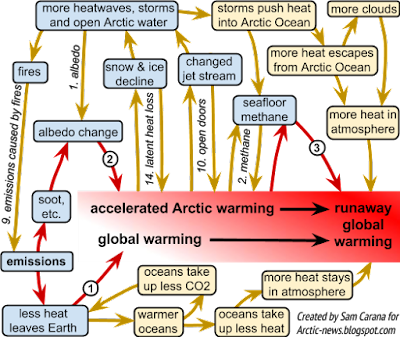 Associated changes include the loss of the ice buffer (latent heat), greater heat transfer into the Arctic Ocean due to stronger winds (and the resulting freshwater lid on the North Atlantic) and more heat entering the atmosphere due to more open water in the Arctic Ocean. A 1.6°C warming due to albedo changes and associated changes seems possible over the next few years, as discussed in this post. 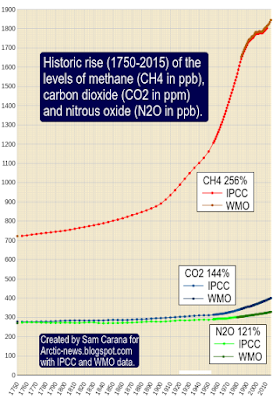 In conclusion, as temperatures keep rising, a 1.1°C warming due to methane releases from clathrates at the seafloor of the world's oceans seems well possible over the next few years and even more warming seems possible beyond that, as also discussed in this post. Rising temperatures will result in more water vapor in the atmosphere (7% more water vapor for every 1°C warming), further amplifying warming, since water vapor is a potent greenhouse gas. 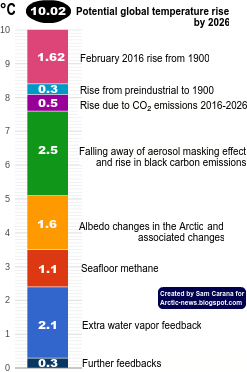 Extra water vapor will result from warming due to the above-mentioned albedo changes in the Arctic and methane releases from the seafloor that could strike within years and could result in huge warming in addition to the warming that is already there now. Additional water vapor in the atmosphere and extra energy trapped in the atmosphere will result in more intense storms and precipitation, flooding and lightning. Flooding can cause rapid decomposition of vegetation, resulting in strong methane releases. Furthermore, plumes above the anvils of severe storms can bring water vapor up into the stratosphere, contributing to the formation of cirrus clouds that trap a lot of heat that would otherwise be radiated away, from Earth into space. The number of lightning strikes can be expected to increase by about 12% for every 1°C of rise in global average air temperature. At 3-8 miles height, during the summer months, lightning activity increases NOx by as much as 90% and ozone by more than 30%. The combination of higher temperatures and more lightning will also cause more wildfires, resulting in additional emissions such as of carbon dioxide, methane and carbon monoxide. Ozone acts as a direct greenhouse gas, while carbon monoxide can indirectly cause warming by extending the lifetime of methane. For years, global warming was also thought to be held back by growth of sea ice around Antarctica and the greater albedo resulting from that. 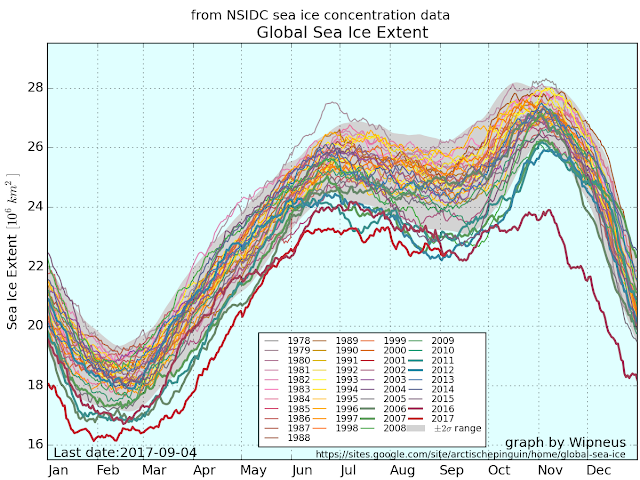 As the image below shows however, global sea ice extent has been extremely low for more than a year. Ever warmer oceans and stronger winds that move sea ice away from Antarctica make the outlook for global sea ice grim. Furthermore, higher temperatures look set to cause more growth of algae and melting, resulting in further albedo decline. Additionally, greater stratification of oceans results in less phytoplankton and thus less carbon dioxide that will be taken by oceans out of the atmosphere, so more carbon dioxide remains in the atmosphere. More carbon dioxide in the atmosphere means that less heat can leave Earth, as it gets trapped by the carbon dioxide, so this is another self-reinforcing feedback loop that further warms oceans, as described under feedback 29. A closer look at each of these warming elements shows that abrupt warming could take place in a matter of years. As far as the first two elements are concerned, i.e. the rise from 1900 and the rise from 1750 to 1900, this has already eventuated. The speed at which further warming elements can strike is depicted in the image below, i.e. the rise could for a large part occur within years and in some cases within days and even immediately. 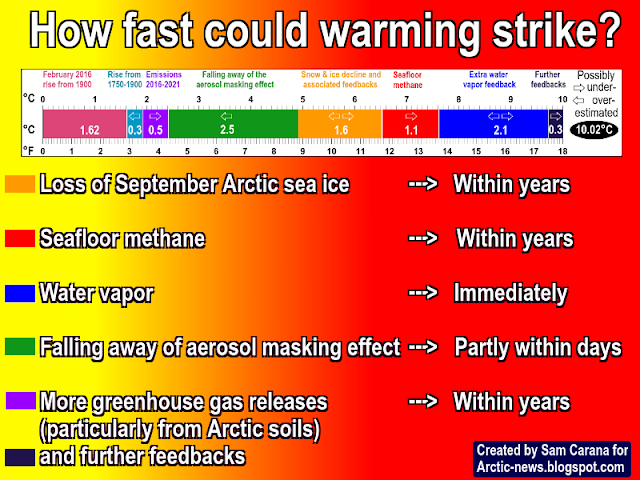 How fast could temperatures rise? As the image shows, a rise of more than 10°C (18°F) could take place in a matter of years, resulting in mass extinction of many species, including humans.